Alnwick was awash with pork pie hats, fezes and monochome chequered T-shirts yesterday as the town was struck by more than a touch of madness. It wasn't a new fashion wave nor traditional dress, although the black-and-white pattern could be misconstrued as a magnified version of the Northumberland tartan. No, it was an invasion of ska, with the kings of Two Tone headlining the latest in the spectacular Summer House Sounds concerts in the Pastures opposite Alnwick Castle. Madness were here and their legion of fans were going to make their presence felt. The streets were awash and the pubs overflowing - with strains of Baggy Trousers and Our House blasting from bars, vehicles and groups of happy revellers enjoying impromptu singalongs. The weather was perfect, the setting was perfect and, guess what, the music was perfect - all three bands, including supports The Lightning Seeds and The Tailormade, delivered ... and some! From the moment, The Tailormade cried 'Hello Hogwarts', this concert was magic. There was already a fantastic atmosphere, laced with a canny dollop of nuttiness that harked back to the heyday of ska in the late '70s and early '80s. But both the warm-up acts were excellent, the BBC Radio 1 Breakfast Show house band, The Tailormade, kicking off with a catchy set of vibrant tunes that started the vast crowd jumping. I reckon there will be a new band of fans and a few downloads made after that performance, edgy, fun and on message. Next up was The Lightning Seeds, who headlined the recent Northumberland Live concert at Blyth, with a short set of some of their numbers. There was a lot of love for the Seeds - they could have played for another half-hour for my liking. Sadly, England didn't quite reach today's World Cup Final, which would have prompted a rendition of the Seeds' most famous song - frontman Ian Broudie collaborating with Baddiel and Skinner for Three Lions, the football anthem of choice these days. The crowd did their best to persuade them to give it a shot anyway, with their own chorus of It's Coming Home in between songs, but to no avail! By then, the anticipation had reached fever pitch, suitable headwear had been donned and there was a rush to get closer to the stage. 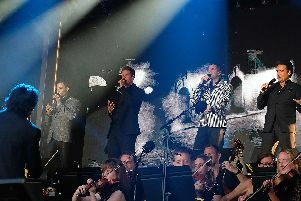 And so, to the glorious refrains of One Step Beyond, our heroes appeared, the charismatic Suggs captivating throughout, backed by five of the seven original members of one of Britain's favourite groups. "Look at this lot," Suggs said, gesturing to the band. "I'm surprised they're all still alive!" Amazing saxophonist Lee Thompson, guitarist Chris Foreman, Mike Barson on keyboards, drummer Dan Woodgate and bassist Mark Bedford all played their part. While they may have lost some of their energy, they are still engaging and brilliant live. And the sight of hundreds of red felt fezes bouncing up and down was amazing! The staging and lighting was not the flashest I've ever seen - no big screen for those stuck at the back of the field - but to be honest, it was not required - it was the sound and the near-the-knuckle banter that took the honours. After a blast of Embarrassment, Suggs and Co took us back to beginning when they burst onto the music scene in 1979 with The Prince. Hit after hit rolled then off the set - My Girl, The Sun and the Rain (which inappropriately, in the middle of a 1976-style heatwave, begins 'It's raining again', as Suggs pointed out) and Wings of A Dove among them. But it was when they hit their only UK number one (incredibly), House of Fun, that the party shifted into overdrive. Baggy Trousers, Our House and It Must Be Love followed and the audience were in a crazy sort of delirium, reminiscent of those daft days nearly 40 years ago - oh, what a laugh we had! An encore was a necessity - no one was going nowhere, as the boys from Camden Town would put it. Their theme tune Madness and Night Boat to Cairo wrapped up what was a fantastic night for those of us old enough to enjoy a bit of silliness way back when and a whole new generation of younger fans indoctrinated by a legion of blokes like me giving dad-dancing a bad name. More pictures in our gallery, here. The final concert in the Summer House Sounds series is Il Divo, with special guest Michael Ball, tonight at 7.30pm (gates open at 5pm). 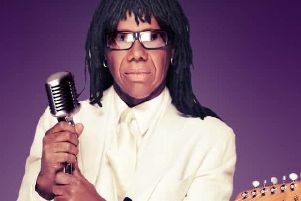 The series started on Wednesday, with Nile Rodgers and CHIC - read our review here, and continued on Friday, with Sir Tom Jones - read out review here.